With its stunning, violent imagery and terrifying ritualistic language, “The Second Coming” is one of Yeats’s most famous and most anthologized poems; it is also one of the most thematically obscure and difficult to understand. (It is safe to say that very few people who love this poem could paraphrase its meaning to satisfaction.) Structurally, the poem is quite simple—the first stanza describes the conditions present in the world (things falling apart, anarchy, etc. ), and the second surmises from those conditions that a monstrous Second Coming is about to take place, not of the Jesus we first knew, but of a new messiah, a “rough beast,” the slouching sphinx rousing itself in the desert and lumbering toward Bethlehem. This brief exposition, though intriguingly blasphemous, is not terribly complicated; but the question of what it should signify to a reader is another story entirely. 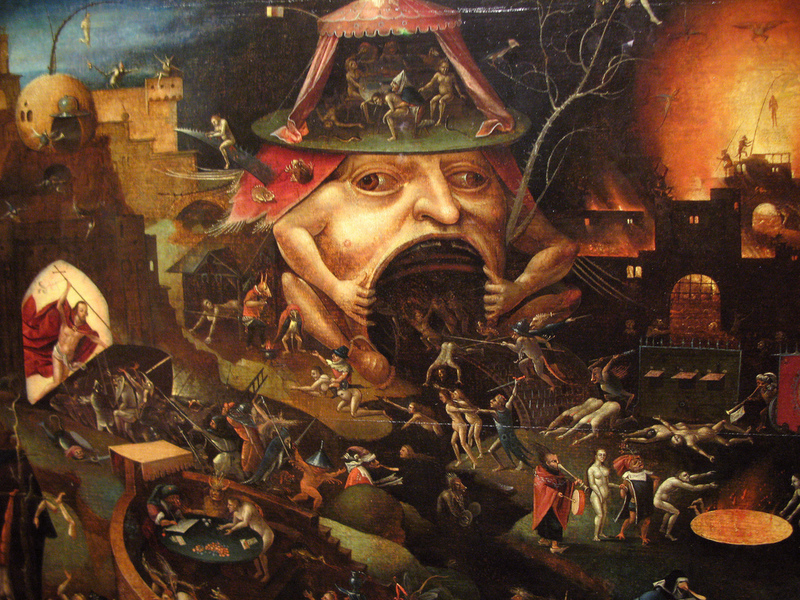 From a personal perspective, when reading this poem images of those such as Hieronymus Bosch’s depictions of hell specifically come to mind. This is due mainly to images that Yeats conveys in this poem through his language. Hieronymus Bosch was a Dutch painter with his work being well known for its use of fantastic imagery to illustrate moral and religious concepts and narratives. In his works Bosch depicts his idea of ‘hell’, it is these works that come to mind when I read ‘The second Coming’ by Yeats as both pieces express their own images of a hell like matter but through different medians.